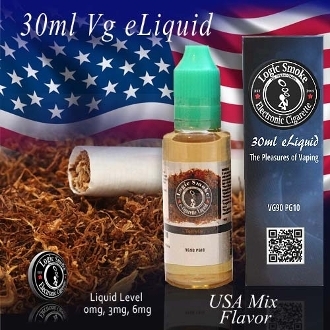 Logic Smoke USA Mix tobacco flavored electric smoker e liquid is an American all time favorite! It's not just any tobacco flavor. It's a blend of tobacco and other special flavors that are very similar to a top selling brand of gold label tobacco cigarettes that features that cowboy on horseback. The flavor is top notch! Are you missing the flavor of your favorite tobacco cigarette but don't want the tar, carcinogens, and high costs? Then USA mix e-liquid is for you. Try this specially made formula in your favorite MOD unit for hours of long lasting, flavorful fat vapor!! Try it today! Logic Smoke 90/10 VG/PG blend is just what you are looking for if you are a MOD user. There are three different nicotine levels available. You can mix them to personalize your nicotine level to what suits your needs the best.